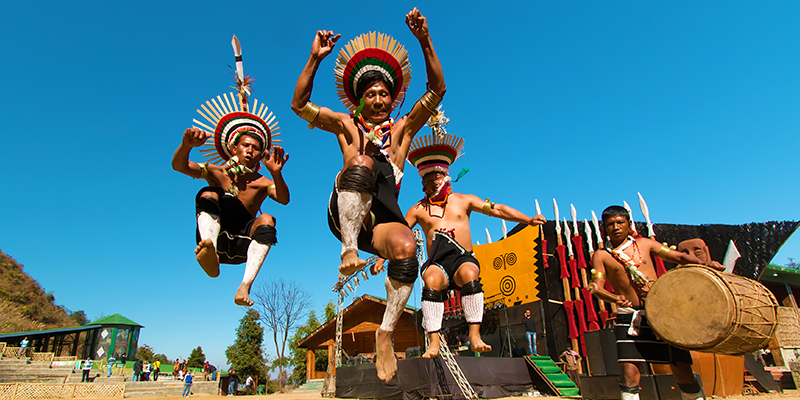 The annual Hornbill Festival held in Nagaland is regarded as the biggest cultural celebration of the region. It is an amalgamation of culture, heritage, folklore, music, lifestyle and surroundings. To be held from December 1-10 this year, the festival had initially started as a celebration of Nagaland Day. On December 1, 1963 Nagaland achieved its statehood and to mark the occasion this day was declared as Nagaland Day. 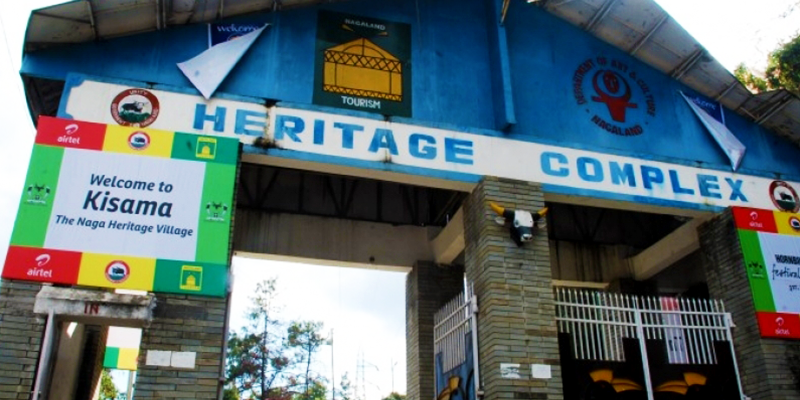 Naga Heritage village, Kisama: Situated 10 KM away from Kohima, the state’s capital, this heritage village was established to preserve the unique ethnic cultural heritages of the state. There are sixteen houses within the main complex which carry the architectural designs and concepts of the indigenous tribes. These houses turn into buzzing marketplaces during the festival. Kohima by night: During the day Kisama is buzzing with action, but when the sun sets, the action shifts to the state capital. These 10 nights of Hornbill Festival illuminates the streets of Kohima and forms a carnival-like atmosphere. There is plenty of action happening all around – from cultural to sports events, from shopping venues to quality food joints. Attending the Hornbill Festival gives tourists a chance to enjoy the various facets of Nagaland’s culture, music, heritage and lifestyle. 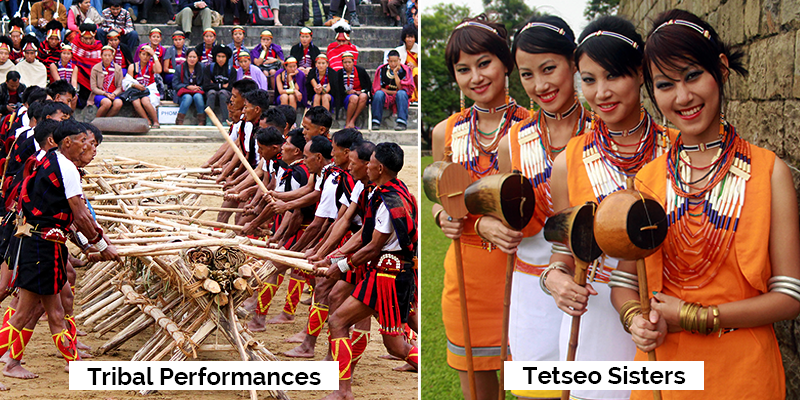 This festival is marked with performances by 17 indigenous warrior tribes of Nagaland. The cultural fiesta attracts tourists from India and abroad. So, what to watch out for? Music performances by Tetseo sisters: This is a must watch during the festival. Four sisters named Mercy, Lulu, Azi and Kuku have taken upon themselves to showcase the folk music of Nagaland to the world. Since 1994, these sisters have performed at several international and national concerts, singing the folk songs of Nagaland. Renowned for their beautiful voices and souls, they also launch their new music albums and calendars in the festival. Tribal performances: Traditional dance, songs and music performances by the 17 tribes of Nagaland display an array of color and form the star attractions of the festival. Street rock contest: There is a street rock competition held on the streets of Kohima and it sees participation from some of the big names from Sunburn Music Festival. Local rock stars: Several rock bands from Nagaland take the centre stage during the nights at Kohima music venues. Bhoot Jhalokia contest: The most famous attraction of this festival is the pepper eating contest. Bhoot Jhalokia or Ghost Peppers are often claimed to be the hottest chilies in the world and are consumed by the people of Assam, Manipur, Nagaland, Meghalaya and Mizoram. There is a contest held where the person consuming most peppers wins. The participants in this ‘hot’ competition are the seasoned chili eaters from India, Mexico, USA, Myanmar, Sri Lanka and Nepal, among other countries. Miss Nagaland beauty pageant: This beauty contest takes places on the third day (December 3 this year) of the festival. The pageant is a well organized show where the young Naga girls compete to become Miss Nagaland and to get an opportunity to represent Nagaland in Miss India. 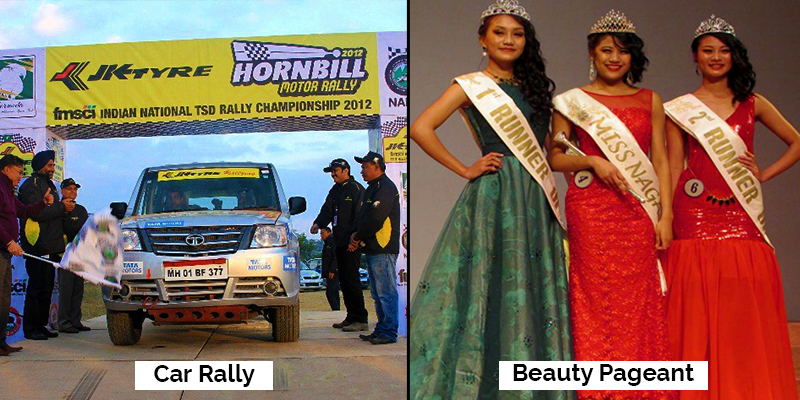 Hornbill car rally: One cannot miss the modified car rally which happens at nights. For all the car enthusiasts, this is an amazing opportunity to witness the automobile creativity of the Naga. When in Nagaland, eat like the Naga! The traditional Naga cuisine is a mix of spices and meat. 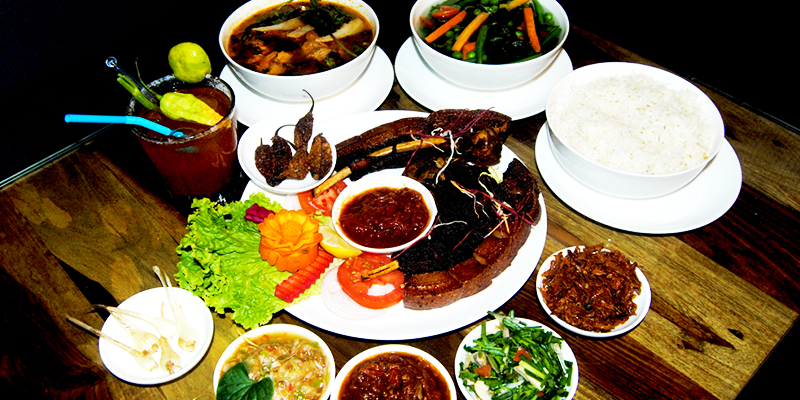 And if you want to enjoy the culinary delights of Nagaland then this is the perfect time. 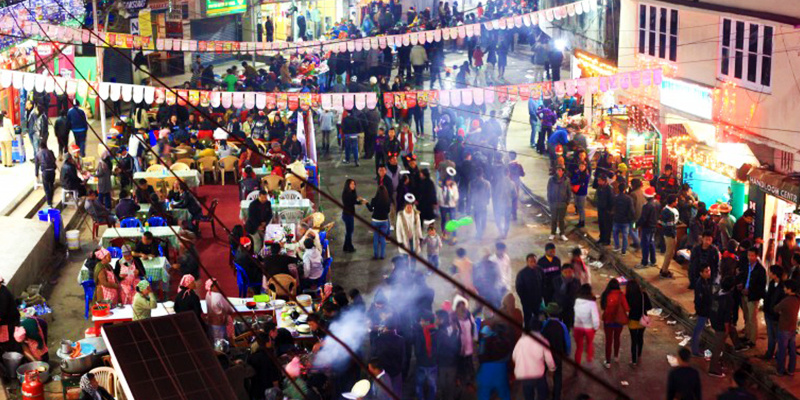 The festival grounds as well as eateries in Kohima serve many delicacies straight from the kitchens of 17 tribes of Nagaland. If you have not eaten traditional food during the festival, then your trip is incomplete. Must Taste: Bamboo steamed fish, eel chili sauce, ghost peppers, intestine soup, grilled dog and fried insects. Tip: Nagas eat using their hands, so you might want to skip the fork and spoon to have a real taste. Traditional arts and crafts stalls are set up on the fair grounds. These stalls allow the tourists to purchase many beautiful and rare artifacts which they might not get any other time. Many Naga huts at the festival are adorned with bull and bison horns which can be bought as ideal souvenirs. 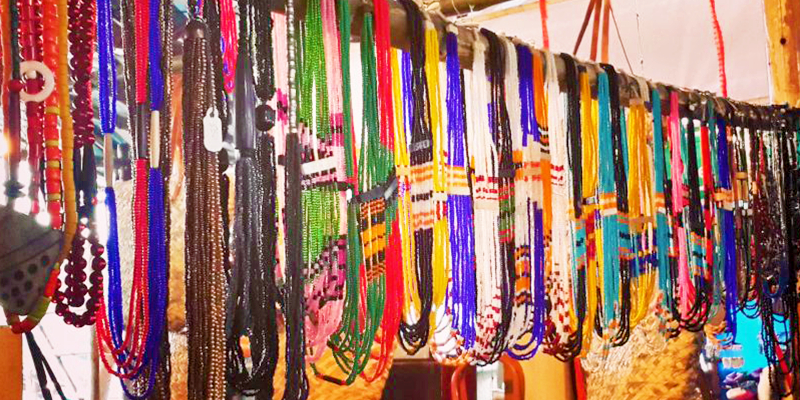 Must Buy: Traditional Naga handlooms, bamboo artifacts, beaded and stone jewelry, Naga handmade skirts and shawls. Tip: One of the biggest attractions of the fair is stalls by Ao tribe.